The official Pottery Making Info logo with a solid background. 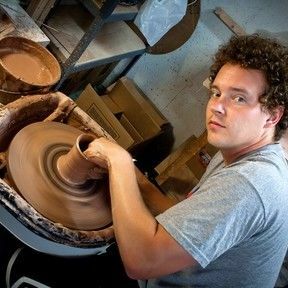 Learn more about making pots at potterymakinginfo.com. This t-shirt is everything you've dreamed of and more. It feels soft and lightweight, with the right amount of stretch. It's comfortable and flattering for both men and women. • 100% combed and ring-spun cotton (heather colors contain polyester) • Fabric weight: 4.2 oz (142 g/m2) • Shoulder-to-shoulder taping • Side-seamed The Male model is wearing a size M. He's 6.2 feet (190 cm) tall, chest circumference 37.7" (96 cm), waist circumference 33.4" (85 cm). The female model is wearing a size M. She's 5.8 feet (178 cm) tall, chest circumference 34.6" (88 cm), waist circumference 27.16" (69 cm), hip circumference 37.7" (96cm).